Shortly detached to Indian Ocean - light cruiser Emden 4,268t, 10-4.1in serving with East Asiatic Cruiser Squadron in Pacific, detached on 14th by Adm von Spee for commerce raiding in the Indian Ocean, sank 15 ships of 66,023grt, one Russian cruiser and a French destroyer. German light cruiser SMS Emden headed for the Cocos Islands to destroy the cable and wireless station on the smaller Direction Island, appeared at 0550 and a warning was immediately sent out by cable station superintendent. Emden anchored and sent armed party ashore which destroyed the installations over the next two and half hours. Around 0630, the warning signal had been intercepted by light cruiser HMAS Melbourne escorting an Australian troop convoy only 50 miles away to the north, sister-ship Sydney was detached to investigate. 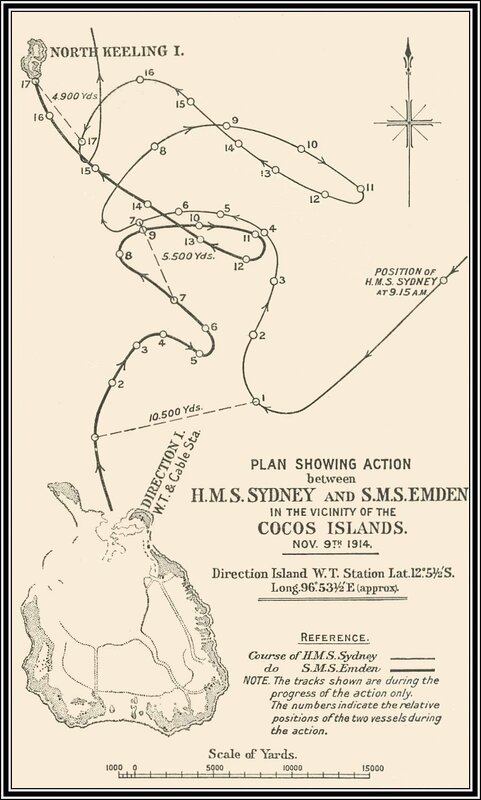 Arriving off Cocos at 0915, Sydney sighted Emden which opened accurate fire at 0940 from 9,500yds, Sydney's after control station was soon hit. Making the most of her longer-range guns, Sydney brought down Emden's foremost funnel, foremast, then second funnel and third, the badly damaged Emden headed for the northerly North Keeling Island and ran aground at 1120. Sydney left to pursue the escaping collier SS Buresk, captured some time before. Schooner Ayesha was seized by German landing party after Emden left them ashore to go and fight Sydney, sailed to Padang, Dutch East Indies, and on to Yemen, part of the Turkish Ottoman Empire. The Germans then travelled overland to Constantinople. Captain John Collings Taswell Glossop, R. N. (H.M.A.S. "Sydney"). Arthur W. Lambert, Chief Petty Officer; R.A.N. 7899. Bertie Green, Able Seaman, R.A.N. 2511. Joseph Kinniburgh, Able Seaman, R.A.N. 2907. Harold M. Collins, Able Seaman, R.A.N. 3157. William Alfred Taylor, Able Seaman, R.A.N. 2820. Thomas Edward Mullins, Sick Berth Steward, R.A.N. 1606.